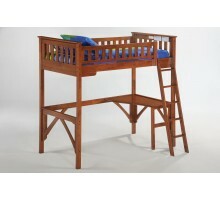 Loft beds with desk underneath are ideal furniture for kids and teenage students who are facing limited space for their unique furniture or want to benefit from extra free space in their rooms. 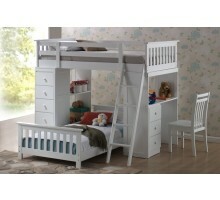 Loft bunk beds for kids come with basic flat work desks to advanced sturdy desks with cupboard and shelving. 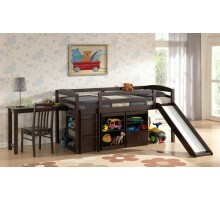 We also carry other types of loft beds including beautiful kids loft bed with slide, loft bed with stairs when your focus is on safety for elder and younger members of your family, twin loft bed with storage steps and trundle bed, loft bed with futon that changes to lounge, sofa, and bed positions, quality compact loft bed with trundle, desk, and storage step unit, solid wood loft bed with dresser and bookshelf, multifunctional wooden loft bed with closet underneath, computer desk, and bookshelf for high school and college students, online loft bed with couch or futon underneath for tight rooms with not enough floor space, modern vanity loft bed with chair, and fun castle loft bed with tower ladder and play area for boys and girls.